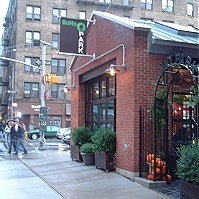 About a block away from Prada you’ll find SoHo Park in an old brick garage. The restaurant manages to keep its garage feel thanks to retractable lights that a mechanic might use, and garbage cans made from old barrels. 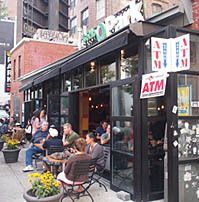 But that’s where the grease-monkey feel ends thanks to large folding doors that open onto the street and a small beer garden on the side. It’s a great spot to sip a pint of Sixpoint ale or a bottle of Kindi Berliner-weiss with raspberry syrup (beers $5-$9). And keeping with the beer garden theme, there is Bavarian bratwurst ($6) and Hungarian kielbasa ($5). We went for the burgers and Belgian cut fries ($4). The hand-cut fries, served on plain brown paper, arrived piping hot and crispy. You can pick from special sauces. We just doused them with some ketchup. They are so-o-o-o-o good! The Park Burger ($5.50) was not as spectacular. It was a tad rubbery and not quite up to the Shake Shack standards, but still good nonetheless. And we immediately forgave the chef upon tasting the gloriously greasy herbed-buttermilk red onion rings ($4) with a garlic aoli dipping sauce. A delicious mess! Also on the menu, a grilled two cheese sandwich ($5.50) and a house roast turkey and portobello ($8.50). Salads include a traditional Cobb and Caesar ($7 ea). We were also impressed that while being so close to Prada we weren't shelling out Prada prices. This is one garage worth visiting!